Prince Edward Island is located in eastern Canada. Prince Edward Island is bordered by the Northumberland Strait and the Gulf of St. Lawrence. Google Earth is a free program from Google that allows you to explore satellite images showing the cities and landscapes of Prince Edward Island and all of North America in fantastic detail. It works on your desktop computer, tablet, or mobile phone. The images in many areas are detailed enough that you can see houses, vehicles and even people on a city street. Google Earth is free and easy-to-use. Get a custom printed large-format Canadian Topographic Map on waterproof, laminated or glossy paper. You can center the map anywhere in Canada that you want and adjust the scale with easy-to-use tools on the MyTopo website. They will then print and ship your map rolled in a tube or folded neatly in an envelope - your choice. Canada is one of nearly 200 countries illustrated on our Blue Ocean Laminated Map of the World. The Canadian province and territory boundaries are shown on the map along with other political and physical features. It displays symbols for major cities. Major mountains are shown in shaded relief. Ocean depths are indicated with a blue color gradient. 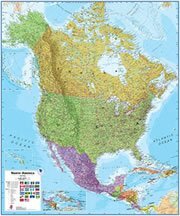 This is a great map for students, schools, offices and anywhere that a nice map of the world is needed for education, display or decor. If you are interested in Prince Edward Island and the geography of Canada, our large laminated map of North America might be just what you need. It is a large political map of North America that also shows many of the continent's physical features in color and shaded relief. Major lakes, rivers, cities, roads, country/province/territory boundaries, coastlines and surrounding islands are all shown on the map. Copyright information: The images on this page were composed by Angela King and Brad Cole and are copyright by Geology.com © 2008. These images are not available for use beyond our websites. If you would like to share them with others please link to this page. 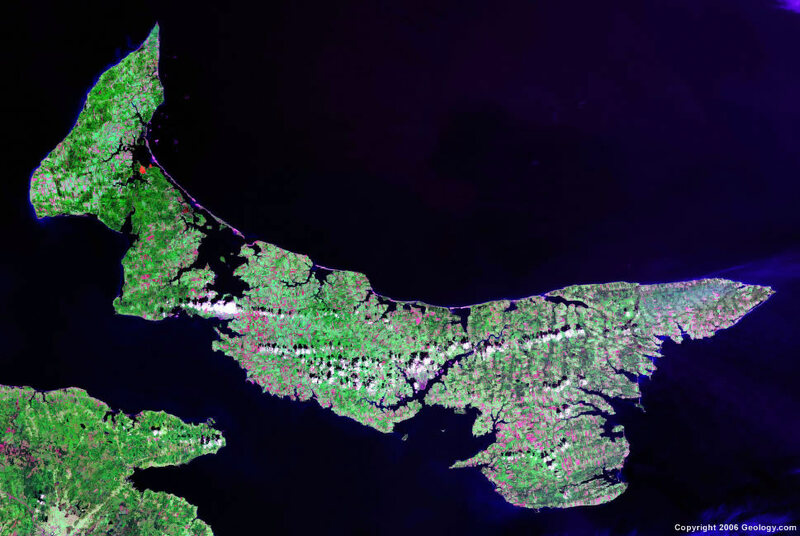 The satellite image was produced using Landsat data from NASA and the map was produced using data licensed from and copyright by Map Resources © 2008.